Actors Peter O'Toole (L) and Omar Sharif in a still from the film "Lawrence of Arabia." One of the marvels of cinema has returned from the desert, looking as majestic as ever for its 50th Anniversary. “Lawrence of Arabia,” director David Lean’s sweeping, epic tale of World War I British officer T.H. 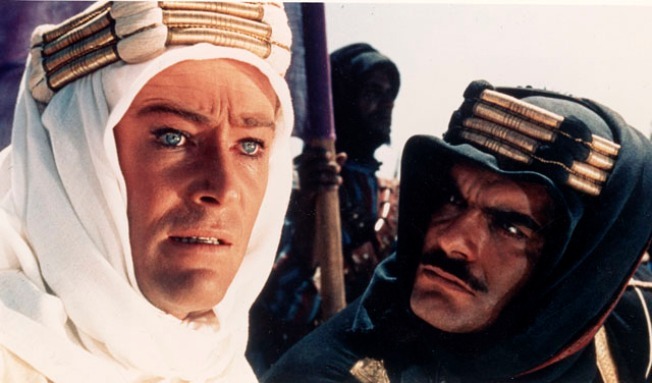 Lawrence’s (Peter O’Toole) trek into the Arabian deserts to unite conflicted tribes against the looming Turkish Empire, has been restored to its most pristine condition since its debut in 1962. Long considered one of the finest and most influential films of all time, ranked 7th on the American Film Institute’s 100 Greatest Movies and certainly viewed as Lean’s masterpiece, the film won seven Academy Awards – including Best Picture and trophies for Lean, O’Toole and supporting actor Omar Sharif – from its 10 nominations. The painstakingly reconstructed epic makes it long-awaited debut in Blu-Ray in both a two-disc set and a lavishly crafted limited-edition, four-disc collector’s gift set featuring three Blu-Ray discs, exclusive featurettes, a CD of the original soundtrack with previously unreleased tracks, an authentic 70mm film frame newly printed and numbered and a 88-page hard-bound coffee table book that features rarely seen photos. Grover Crisp, who manages the restoration, preservation and mastering of the Columbia Pictures and TriStar Pictures film libraries for Sony Pictures Entertainment, reveals some of the secrets of bringing one of the most visually breathtaking films of the 20th Century back to its full grandeur. What do you love about the restored version now when you look at it? I personally think – and this is not just my opinion, of course – it is one of the great films of all time. It's just a magnificent motion picture. I actually feel it's an honor to be able to do anything with it. To be able to kind of bring it back to life again, they did that in the '80s with that restoration which is all photo-chemical and they did a fabulous job. We wanted to just kind of extend that work into the future with what we can do technologically now to improve it, to improve things that they couldn't do back then. That's really what it was about. What kind of condition was the film when you started? We wanted to work with the original camera negative this time. I knew the film negative was in extremely poor condition. Fragile: It was scratched; it was damaged in a number of ways, but I also knew that to get the best image quality for this new release, and really to celebrate the film, we had to go back to that negative. So that is what we did, starting several years ago. We knew that we'd have a lot of work to do, but I think we knew it would be worth it. Was there a nail-biter that ended with a big victory on the restoration? I can say that as damaged as I knew the film was, when we really got a good close up look at it, we were actually shocked that it was worse than we thought. When you can really look close up at the negative in a really high-resolution way everything is very visible, all the good qualities and all the bad qualities. So some of the damage to the emulsion, which we knew was present because we could always see it on the prints, we thought was just in certain sections of the film actually ran throughout the whole film. So that was a big shock to us. It actually probably added at least four or five months to the process, trying to figure out how to clean it up. We had to actually invent technical processes to take care of some of this. That was something that we'd never seen before anywhere, on any film and we've worked on hundreds of films over the years, always with the camera negative. We've encountered a lot of strange anomalies, but this was certainly a very strange one and everyone who looked at it would just say, 'What is that?' And we'd have to explain what it was. So the challenge is to try and fix those things, and is now one hundred percent perfect? No, but it's a huge improvement – or at least I hope everyone will think so when they see it. Having watched this film over and over in the restoration process, do you have a portion of it that you never get tire of watching? There are a number of iconic scenes in the film, of course: the blowing out of the match and the sunrise and the whole desert sequence, it just has a completely otherworldly feel to it which is what, of course, it's all about because that's his introduction to the desert. That is something that people know by heart and is obviously one of the great sequences of all time. Are you in the midst of another major restoration right now? We're always working on restorations. We're doing a restoration of 'On The Waterfront' right now and a number of other films that are in the works that we hope to get out in the theaters and on Blu-Ray and any other way that people can see these films.